Moreton Bay fig tree in Library Park, Monrovia, CA, by Monrovia Public Library. Licensed under Creative Commons. Editor’s note: John Cobb delivered a version of this talk at the PANDOTOPIA Blitz, July 17, 2018, at the Maryknoll Sisters’ campus in Monrovia, CA. I am truly honored and delighted to have this chance to share my hopes and dreams with you. You are people who have hoped and dreamed, and I think that many of your hopes and dreams have been like mine. Like mine, yours have often not been realized. But you have kept on keeping on. You have lived by the theological virtue of hope, rather than the fragile optimism that moderns derive from their scientific and technological achievements. A few years ago, your great church chose as its leader a man who not only shares our beliefs but also lives them far more fully than most of us, certainly than I. Three years ago, he addressed the whole world with an impassioned plea that we humans turn away from our cruel and suicidal behavior and bring into being a new civilization, based on understanding ourselves as part of an integral ecology. Our hearts have been stirred, and our minds profoundly stimulated. The leader of the church had spoken as a true follower of Jesus. We want to follow him. There is a unique historical opportunity. We are gathered to consider ways in which we might do so. Each of us comes to this challenge with a distinctive story. I will share mine. It will explain my enthusiasm for Laudato Si’. I begin by simply stating what I learned in my studies on the GI bill at the University of Chicago in the mid-1940s. I learned that the dominant teaching of the modern world implied atheism and even nihilism. I learned that the key teachings on which it was based were highly disputable, and that better teachings existed. I learned that very few of the leaders of the modern world were interested in an alternative vision. They were ready to make adjustments, but the basic assumptions of modernity were considered sacred. The enormous increase of knowledge and power over nature to which these beliefs led was sufficient grounds for placing them beyond criticism. The superior alternative vision that I encountered at Chicago can be called “neo-naturalism,” that is, a new understanding of nature. This new understanding fully accepts the scientific reasons for insisting that human beings are part of nature. However, it concludes that if this is so then nature is not limited to the clockwork, or nature as machine-like, that most modern Western scientists and philosophers have posited. Nature is better understood in organic terms than in mechanistic ones. Organic things exist only in complex relationships with other things in what we call ecologies. We can learn much about organisms when we treat them as independent of other things, but when we suppose we have thereby understood what they actually are, we deceive ourselves. Studying individuals in isolation produces an incomplete picture, and these kinds of abstractions are not the real organisms. This teaching, which had grown out of contemporary study of nature, was in part a return to Aristotle. Descartes created the modern mind by rejecting Aristotle’s interest in “final causes.” Those who taught me to re-think nature in this way reintroduced purpose into the world. They followed diverse teachers , such as Henri Bergson, William James, John Dewey, and Charles Saunders Peirce. At Chicago, Charles Hartshorne and Henry Nelson Wieman were especially influential. Neo-naturalism, however, failed to replace the modern mechanistic worldview. It did not succeed in penetrating deeply into the sciences. The great majority of physicists, chemists, biologists, physiologists, and neuro-scientists did not want to adjust their methods and concepts to a different paradigm. This has meant that, just as the natural sciences had long studied a nature they viewed as having no purposes or subjectivity or value in itself, now they study human beings in the same way. Our leading universities proclaim that they are dedicated to value-free research. Human history and human behavior in its entirety are now explained without any attention to purposes, subjectivity, or values. When values are excluded from the curriculum, the value that remains is mammon. For most people in the United States, the reason for schooling now is to make more money. As neo-naturalism lost out generally in higher education, I felt some responsibility to keep it alive. I had the opportunity to develop a “faculty project” at the Claremont School of Theology, and I called it the Center for Process Studies. Our efforts were largely devoted to keeping a foothold for an organic view of nature in various academic disciplines. The conferences went well, more and more evidence supportive of our views showed up; but this organic view kept losing ground in the academic disciplines. Meanwhile we were joined in our basic vision by the wonderful influence of Teilhard de Chardin. He quickly developed a larger and more devoted following than any of the earlier neo-naturalists. We were very pleased that some of the leaders of the Teilhardian movement in the Catholic Church recognized our overlapping interests. There was a brief period, after Vatican II, when our joint movements seemed to have a chance of deeply influencing the Catholic Church. It was a time of great hope, but as you know, it ended, abruptly and painfully. For me, Laudato Si’ brought back into the Catholic world the kind of understanding that had so enriched my life at an earlier period. In the late sixties we learned that modern civilization was heading for self-destruction. This deepened my sense that the assumptions of modernity should be replaced with better ones. The whole matter took on an increased urgency. The destructiveness of modern civilization was not only cultural. It threatened biological life as well. I thought then, and I think now, that no calling could be more important than to work for the healthy survival of our species. There was a brief period when I could join a powerful movement working for “sustainability.” I claimed to make a specific contribution, that is, a scientific and intellectual one. Although it was very important to pay attention to the effects of modern actions on the natural environment, unless we looked at this environment differently, the changes might not last. To see ourselves as part of an integral ecology is radically different from the modern vision. The “sustainability” movement drew together many people who had not previously seen one another as allies. It seemed important to many others who took no action, but who agreed that we should not act unsustainably. The movement was successful in getting some excellent legislation passed in Congress and signed into law by Richard Nixon. We hoped to build on that. But that did not happen. The sustainability movement had taken the corporate and financial leaders by surprise. They saw that raising doubts about increasing consumption for its own sake would work against their interests. But they could not directly come out in favor of acting unsustainably. Many sought to confuse and fragment the movement. Few in any field appreciated the depth of rethinking that genuine “sustainability” demanded. President Bush came out in favor of sustainability, but the sustainability he favored was that of economic growth. The unified movement for sustainability was fragmented into scores of worthy causes. All who were concerned were encouraged to take up a cause or two. Political efforts were directed to saving the whales, or reparations for Blacks, or organic agriculture, or using less plastic. The votes that could be mustered in Congress for any one cause were too few to achieve progress. The best that could be done was to preserve the legislation of the early seventies. Today that is under severe attack, and some of the attackers now publicly reject concerns for sustainability. This fragmentation was partly overcome, finally, by the broad sweep of the climate crisis. Climate is only one part of the environmental crisis, but many people united in opposition to actions that speeded the heating of the planet. The unity sufficed to produce the Paris Agreement. Nevertheless, even this success highlights the problem of responding adequately to the overall crisis we face. Despite all the efforts to counter it, climate change has continued and has even accelerated. Bill McKibben organized 350.org to oppose going further than 350 parts per million of carbon dioxide in the atmosphere. But we passed that marker long ago. He wisely calls for us to leave the remaining fossil fuels in the ground, but the search for more has never been more intense. Climate change and other environmental disasters that were predicted for the future are now happening. Many species of plants and animals are disappearing. Glaciers, especially in Antarctica, are melting faster than expected, and the ocean level is rising. Climate refugees are increasing, and the current reaction to the immigration of a few millions of refugees bodes poorly for the response to the tens of millions we must expect. Feedback loops are accelerating the problems. Widespread human death is now inevitable. Why do we continue to rush toward collective suicide? The problem is that when we do not change our basic assumptions about who we are and what the world is like, the best we can do is make adjustments to deal with particular problems. Just as my ancestors in Georgia could not imagine their society without slaves, we cannot imagine abandoning our automobiles. Some of my ancestors tried to humanize slavery somewhat. We try to deal with the problem by improving mileage or encouraging carpooling. But really to reduce our damage to the weather system would require changes in the nature of our civilization. As long as the assumptions of the modern world shape our education, our economics, our agriculture, and everything else, concessions to us “alarmists” will not change the direction. Unfortunately, most people cannot imagine an alternative to modern civilization. This has seemed so important to me that I organized a conference in June of 2015 to display how the many specific needs for change can be understood as contributions to an overall development of a different civilization. We called it an “ecological civilization.” Our guiding image was the aspen grove that appears to be many trees but has a single root system. This genus is populus. The largest populus grove is in southern Utah and is named Pando. We now use “Pando” as a symbol for what I call ecological civilization and Pope Francis describes as “integral ecology.” I hope that some people saw that a different civilization, ecologically balanced and socially just, is possible and that they could contribute to its coming into being. As conferences go, the 2015 event was successful. But, of course, by itself, a conference changes little. Everything depends on follow up, and I am grateful for all that Eugene is doing in this regard. Equally important may have been that a few Maryknoll sisters were there from Monrovia and fell in love with Pando. Pope Francis published Laudato Si’ just a few weeks later. We understood at once that we were on the same page. But whereas our efforts, at best, could affect a few thousand people, his could affect billions. This was what we needed. Our efforts would be thrown into supporting his. From attendees at our conference we collected sixty short responses to Laudato Si’, and published a book of enthusiastic appreciation to greet him on his arrival in the United States. The encyclical, just by its existence, has achieved a lot. It gives permission for work that otherwise might not be done. It affects the discussion of the future and its needs. It makes clear that what must be changed is the entire civilization. But more is needed, much more. What it does not do is to give specific directions about the changes that are needed and how to initiate them. For example, it implies that we need drastic changes in education, but there is little clarification of just what the needed education would be. We also need a new economic system, but what will that look like? Because we are seeking an integral ecology, the needed discussion of many distinct topics will entail in every case other topics as well. A full account of what kind of education is called for by the goal of integral ecology would eventually include the kind of economics and agriculture that are required. But equally we cannot work out the economics needed without envisaging how people will be educated. An integral ecology requires integral envisagement, but it also needs to be worked out in its particularity for multiple sectors. Who will work on this huge task? Many people, I hope. And among them I am particularly hopeful that the most independent leaders of the Roman Catholic Church will make their contribution. I refer to the Catholic sisters – to you. I am hoping that we can work together on this task. Your presence at this conference signifies your willingness to consider this possibility with us, and we are eager to brainstorm where we could begin. My view is that one could in principle start anywhere in reflecting about an integral world. The decision for each group will depend on what their interests are competencies are. The topic that comes first to mind is “spirituality.” Who is better prepared to give global leadership on spelling out what kind of spirituality will help move us toward integral ecology and then support its continuing development? If Catholic sisters cannot do this, then who? The requirement is that those who do this work have deeply interiorized Laudato Si’, and so far as I know, you are in the lead here. Another place to focus may be where the most relevant work is already going on. I judge that the nature of the new civilization for which Laudato Si’ calls is already being clarified in some fields. Much is already being done on integral or holistic discussion of human health. There are many who recognize that modern knowledge contributes to human health, but that modernity’s exclusion of much that other cultures have learned has been a very serious limitation. Today integration of indigenous knowledge, folk wisdom, Chinese and Indian knowledge is also stimulating radically fresh experiments and explorations. This breaks sharply from the modern paradigm. It is just the kind of thinking that we need to implement Laudato Si’. You sisters could spell out where the world now stands and how creative thinkers and practitioners are developing new paradigms appropriate to integral ecology. Developing a Laudato Si’ understanding of human physical health will also lead to discussions of emotional and spiritual health and of the kind of changes we need in the science of psychology. My appeal is to point out these connections and encourage their exploration but recognize that much can be said about physical health even before all that is done. The discussion of health quickly leads to a discussion of food. This is not only a matter of which foods we select from the shelves of grocery stores, but also of how these have been procured and processed. Human health, we quickly see, depends on healthy soils and shortening the distance from harvest to table. This is another area in which many of you have already done much to develop an alternative to modern food systems. My guess is that it could well be another early topic to be considered. Viewed globally the modern response to these issues is still dominant. Specialization in food means that most of what we eat has traveled hundreds, if not thousands, of miles. Monocultures of annuals heavily dependent on herbicides, insecticides, and chemical fertilizers produce most of our agricultural products. Soil loss is taken for granted and is accelerating. The technological response is to grow plants and produce meat in factories. Food quality is declining, leading to health problems. This decline of health is multiplied by processing and fast foods. There is plenty of work to be done. But the literature criticizing all this is already vast. At the creative margins we are already far along in envisioning what integral ecology calls for. We like to say that a more Pando way of life is already happening. Wes Jackson has already produced a perennial grain that can put an end to the need for annual ploughing. Much is being done to shift from monocultures to polycultures that will deal with noxious insects and weeds biologically instead of chemically. There is great progress in understanding dietary needs and the advantage of urban agriculture and “victory gardens” to insure wholesome food. I am delighted that the Maryknoll Sisters are exploring with us how to make of this property a residential research park for integral ecology, what we are calling, Pando at Maryknoll. It will not try to tackle every deficiency related to the vast scope of integral ecology at once. How to enter this field of reflection and action would itself be a topic for discussion. But I will put on the table my current proposal based on my assumption that food security is important to the vision of Laudato Si’. This means that we must learn to produce enough food to survive in the Los Angeles region if and when economic, military, or technological crises interrupt the inflow of food from around the world. This requires that we join the movements of urban agriculture and family gardening. A great deal of experimentation here is needed. For instance, I have gradually been taught the importance of three-dimensional agriculture, and would like to see experiments here. Far more can be produced in a limited area if one uses the space up to five or six feet above the ground as well as the ground surface. Growing grapes and beans in this way is, of course, commonplace. Not far from here, in Pasadena, there is a family living in a suburban environment that uses three-dimensional farming to raise food in their yards. They produce all their own food except grains, sell some to local restaurants, and put on dinners for guests. They use water very frugally. They call their establishment “Path to Freedom.” They have developed and patented many devices and procedures and have much to teach the world. They are an example of some of the kind of local resources that I would like to see us tap into, and in the process encourage and help. Here at the Maryknoll compound in Monrovia, I think it would be exciting eventually to devote even as much as an acre or two to several examples of gardening. This could become a place where people considering using their yards for food production could come to see examples of what is possible. It could also be a place that gives creative thinkers about these matters an opportunity to speak and to interact with others. Together, they might work on a document explicitly describing what Laudato Si’ food production would look like. An effort of this kind might model what is needed in many other sectors. And given that elsewhere, sisters are working on other topics related to food production, there could be the possibility for rich cooperation and interaction. And, of course, the cooperation could be extended much further if less directly related topics, such as education, that were being worked on elsewhere came to be integrated into the conversation. In closing I will confess to a personal reason for hoping that here in Monrovia we might do something that deeply expresses what I think of as Pando values. By chance, or as I prefer to think, providentially, in recent years my most important work has been in China. I have played a small role in persuading the government not to copy the United States in replacing its rural villages with industrial agriculture. The government has shifted policy more in the direction of developing the countryside rather than bulldozing an ever-increasing number of small villages down. I am happy to see that, currently, more Chinese are moving from cities to countryside than the other way. This reverse migration is in my view a positive development if rural life truly becomes revitalized. Because I get some credit for drawing attention in China to the value of rural development, I have a voice with respect to related matters. Of course, the problems are still very serious. There are still a few hundred million migrant workers in China, many of whom likely assume that depending on tiny farms will leave them in poverty. In Claremont each year, we have around a hundred visitors from China. While they are with us, I would love for them to learn how intensive farming of a small area can provide a good living. My hope is that the values of integral ecology might be seen as integrating urban and rural richness, and that on that basis millions of Chinese families could have more of a realistic hope than the current situation allows of being reunited. This could also help in another way. Until recently, China has been basically self-sufficient in food production. However, as Chinese become more prosperous, they eat more meat. This is not good for their health. It also creates a national problem that has become a global one. China is now competing with other neo-colonial powers to procure land in Africa and the Amazon basin to produce the meat its people demand. Africa is already having problems feeding its own people, and the Amazonian forests are still the lungs of the world. More starving Africans and reduced global availability of oxygen are not what the world needs. Increasing the food production of small plots in China could go a long way to ease crucial human problems. 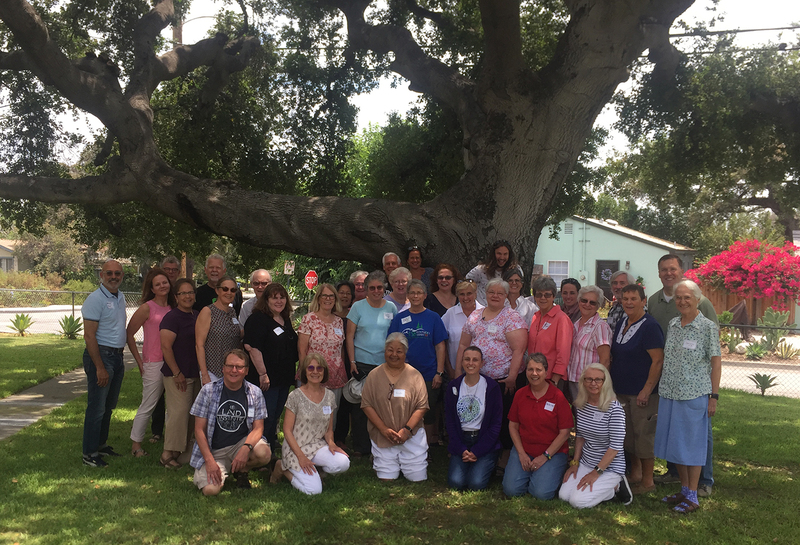 You will understand that for a multitude of reasons I care so much about the possibilities that have opened up here in Monrovia due to the generosity and vision of the Maryknoll Sisters. This is but a test-case opportunity for exploring the implications of Laudato Si’ more broadly, including in rich collaboration with you all. Given the vision of Pope Francis as expressed in Laudato Si’, I see the fields as white for a Pando harvest. But the laborers still seem to be disappointingly few. I hope against hope that working together, we can make a real difference and seize the unique historical opportunity before us. John B. Cobb, Jr. is founding chairperson of Pando Populus and a member of the American Academy of Arts and Sciences.